In recent years, the Canadian government has banned scientists working in its institutions from talking about a growing list of resea­rch topics, including snow­flakes, ozone layer, salmon and the previously published work about a 13,000-year-old flood. This year, the department of fisheries and oceans released new rules that bar scientists from discussing their findings with the public or publishing them in academic journals. The scientists are talking back. Researchers in 16 Canadian cities called protests on September 16 against policies that bar researchers from talking about their work with journalists and, in some cases, fellow researchers. “There is a lot of concern in Canada about government scientists not being allowed to speak about their research,” said Katie Gibbs, director of a new group, Evidence for Democracy, which is organising the pro­tests. 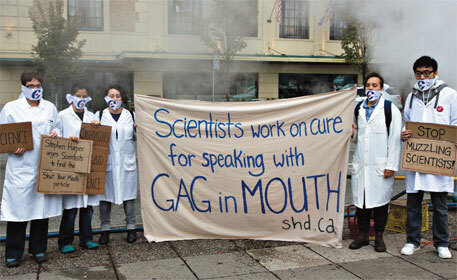 The rallies in Toronto, Ottawa, Vancouver and other cities are the second wave of protests in a year by scientists.